(Phys.org)—Australia's smallest and most numerous mining prospectors can show us where new gold deposits are. Insects can carry gold from underground up into their mounds. Dr Aaron Stewart and his CSIRO colleagues have shown that they also accumulate metals in their bodies. In Australia—geologically the world's oldest continent—new mineral resources are becoming increasingly difficult to find, because they tend to be overlain by layers of sand, gravel and soils. But insects provide valuable clues to where these resources lie. "What is really great about ants and termites is that we can use their work instead of spending vast amounts on expensive drilling," says Aaron, a research scientist with CSIRO in Perth. "After 150 years of exploration, the easiest deposits near the surface have been discovered. We need new ways of finding gold." "Most of Australia is covered by a layer of earth that hides buried minerals. But signs of a resource are often close to the surface. 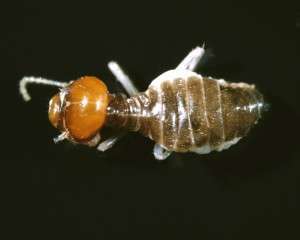 In some places we have shown that termites and ants can bridge that gap by bringing up evidence from five metres down." 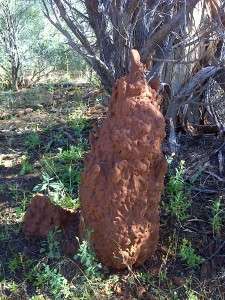 "Our new research shows that it is not only the really big termite mounds like the ones found in northern Australia that can be useful. 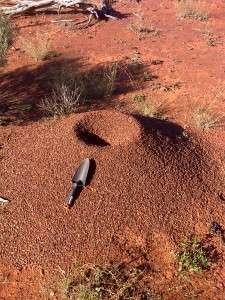 Small termite and ant mounds that occur all over the country can do the job." At thousands of dollars a hole, the traditional exploration method of drilling grids of holes is very expensive. "Exploration companies are very keen to find ways of reducing costs," Aaron says. "By helping to narrow down the area that needs to be drilled we can reduce the cost of finding new deposits." Several exploration companies are already working with CSIRO to develop and refine the method. Aaron's research was published in the journal Geochemistry: Exploration, Environment, Analysis in November and has also appeared in PLoS ONE. Why do they stockpile gold? Do they foresee a collapse in the world's currencies? I used this method 30 years ago in Rhodesia. The aBantu have been using it since at least the time of the Muwanamutapa. Like the legions of ConservaTards who are now cowering in their end of days bunkers, the ants know the end is near and gold will be the only money available to use their trade for food and services from other insects. Gold is going to $4,000 an ounce. I know that I done did gone and read it on a conservative blog who's done gone and sells gold by the Godly measure called an ounce. Grams is the devils work. Oh, so now you have it in for poor old grandmothers? Maybe steal a few of their gold teeth, huh? While you're at it, don't forget the silver fillings. you shouldn't post while Drunk, Sox oll boy. You should really get off the sause. You have been stoned since your pal Ronmey lost the election. Stoned or not, sox's inane drivel would be just as derptacular.